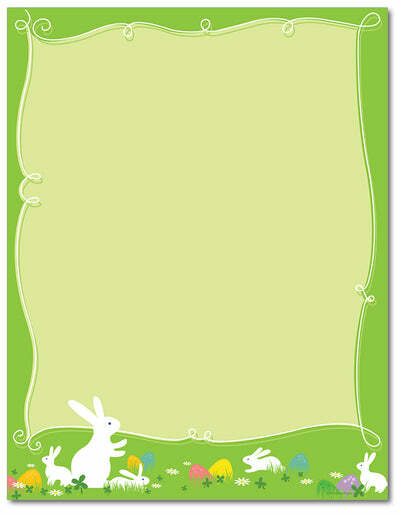 Measurements - 8 1/2" x 11"
Hippity Hop is a classic Easter letterhead that features a green background with several white bunny rabbits surrounded by flowers, four leaf clovers, and multicolored eggs. Perfect for making flyers or invitations for any Easter Holiday party event! This stationery measures 8 1/2" x 11" and is made on a 60lb Text paper that is inkjet & laser printer compatible, acid & lignen free.